.... we remind Grace to let us know if she needs a wee or a poo, and we praise her for keeping her big girl pants dry. On repeat. Like every five minutes. Again and again and again. And the minute we see her start to wee, we run the gauntlet to the potty so she can finish (hopefully) on it, followed by praise and the reminder she needs to let us know when she needs a wee so she can go to the potty and keep her big girl pants dry - because wet pants is yucky! .... we've just finished day two. Thus far, I'm glad to have waders and a shovel in my arsenal. One full wee on the potty (yay!!!) and one dribble. Many on the floor and nothing to report on the poo-bomb. I'm looking forward to day three. Grace definitely seemed to know what was expected. I was a bit miffed when she did a wee in the bath today as we didn't get to practice after the success of her potty-hit before her afternoon nap. Hey ho. All in a days work. Anyway, wish us luck!! Another new thing for Grace this week is talking on the phone. 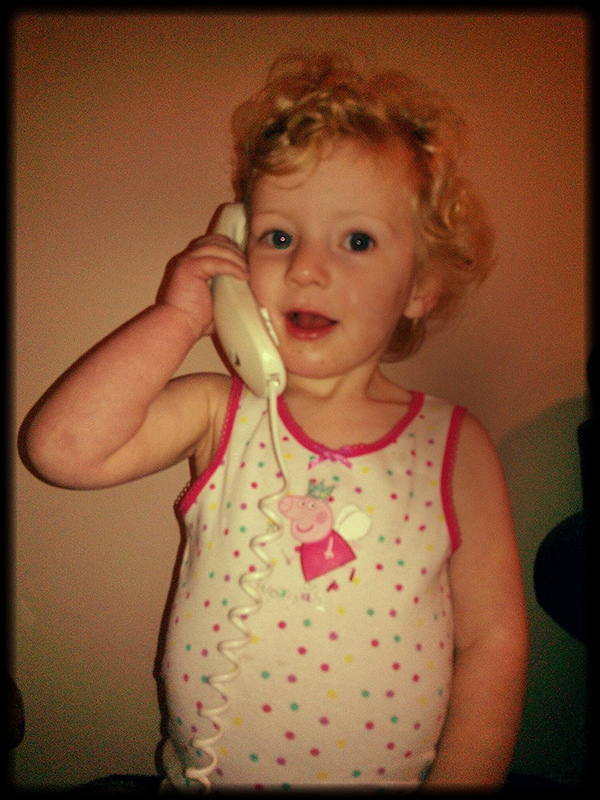 She likes to phone her Nanny and Grandpa in Norfolk.... tonight Grandpa was asleep, so Grace was telling Nanny about her day, and singing Twinkle twinkle little star.... too cute! I'll be checking back in with a progress report in a day or two, there's the weekend left to get the potty training under her belt before back to childcare on Monday.... let's go Grace, I've got everything crossed.